Possibly - and hopefully - not Connacht's last home fixture this season, but Saturday is the final Pro 12 game in the Galway Sportsground, and most probably their last as the champions. Those departing next season will be presented with their jerseys following the game against the visiting Scarlets, including coach Pat Lam and back coach Conor McPhillips who head to Bristol. The Connacht Clan will induct Lam into its Hall of Fame, and on Sunday, Connacht will hold its end of season awards - amplifying the end-of-season feel to this weekend. Despite the emotion of this last home game in a competition which has produced Connacht's most memorable occasions, there are some crucial fixtures still to play, and neither Lam nor his squad will be celebrating yet when seasonal ambitions are still to be achieved. McPhillips says Saturday's fixture, is both "exciting and emotional" in the team's preparation for their impending Champions Cup play-off, and as a final farewell for many in the squad. "Our sole focus is to get into Champions Cup rugby and that would be very satisfying to finish like that," he says. "It's our home ground, we are always passionate at home, we want to get back to winning ways. We have been disappointed with ourselves and for our supporters, and it could be our last home game, so we want to go out on a high." Scarlets, currently in third, have their sights set on a home semi-final making Saturday's task even harder. Traditionally one of the Wales' best all-round outfits, they have won nine of their last 10 games and continue to contribute to the Welsh national cause. "They can play tight through their forwards and they have X-factor in their backs, and like Leinster, they have the confidence of a winning mentality and that is massive, so it will be a tough task, but we are ready for it." Connacht, edging closer to finding their scoring form, will be challenged to complete the chances created through their set piece. "It has been frustrating for us, and we are trying to rectify it. We can only keep trying. We didn't nail everything [against Leinster], but we would like to execute a bit better when we get line-breaks and metres made and defenders beaten, and that is what we have been working on since then." Saturday is likely to mark outhalf Marnitz Boschoff's second only game this season after nearly five months out of action. Boschoff returned from South Africa following the sudden death of his father to help run the sideline for Connacht against Leinster, and has now used last week's break to get back to full match fitness. "There were a few days off for some guys last week, but players who were down on minutes were in for a conditioning week and rehabbing week, and so Marnitz is back to full fitness and available," McPhillips says. "Marnitz has been unlucky. We were excited getting here, and then, in his first start for us, he got injured and was out for a long time. Then there was the tragedy at home which he had to deal with himself," says McPhillips. "But we are his family and we are looking after him as well and trying to get him back to a good place for himself. "I think he is excited to be playing rugby which is what he loves. It is nice to have him back and with the lads who take care of him." Boschoff could be joined by Cian Kelleher who integrated into training this week following a similar length out of action with a hamstring injury. It is good timing for Connacht with Niyi Adeolokun ruled out for five weeks with a similar injury, while Matt Healy has "partially" returned to training having recovered from a hand injury and Steve Crosbie is doubtful with a shoulder knock. Lock Quinn Roux and backrow Eoin McKeon have completed return to play protocols for concussion, while prop Conor Carey is integrating into training after a long-term foot injury. 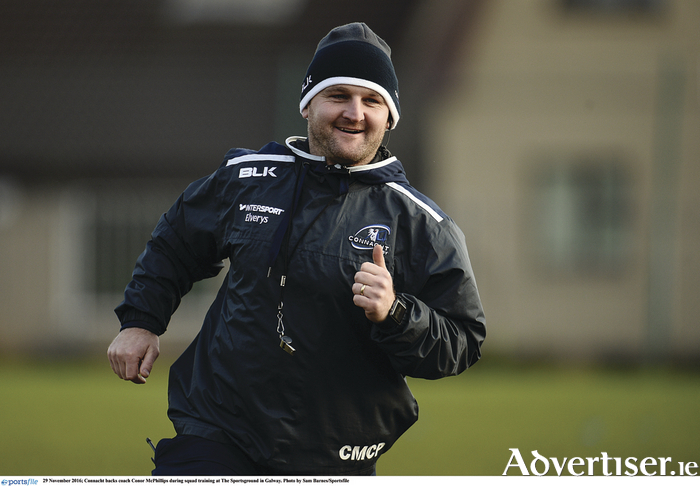 McPhillips, who has spent 12 years with Connacht as a player, analyst, and now backs coach over a 15 year period, says he is not closing the door on a return. "I am here a long time, lot of good people. I'm leaving a place which has changed a lot since I have been here, so it's been a pleasure to be here and it will be emotional. However I would love to come back in the future, a better coach with more experience." Highlights of his playing career in Connacht include playing Harlequins in the Challenge Cup semi-final away, back-to-back losses to Sale, and selection on the Irish senior tour to Japan "on the back of strong Connacht performances", and after moving into management the win over Harlequins' after a long losing streak "so happy for a lot of people involved, proved we could win ugly". Naturally the Pro 12 win is the abiding memory McPhillips takes to Bristol. "Leaving now and seeing how the place has changed since 2003, the amount of kids playing the game, the number of players getting recognition at national level, even the infrastructure. There are so many good people in the organisation trying to do the best for Connacht, and it's been exciting to be a part of it and to see where it has come from. I joined the year after Connacht was nearly shut down, so I've seen both massive highs and lows, but the good memories outweigh the bad and the Pro 12 final - the happiest and most abiding memory."